9/26/01 3 Days and Still Going Strong. August 31st- Proms & Active Regions. - Flare in Region 9600. 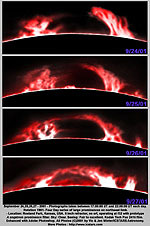 Aug 27, 2001 - Hot Prominences. 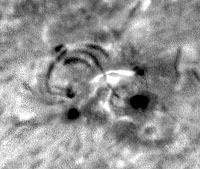 Aug. 26, 2001 Proms & Surface. X-class flare - Aug. 25, 2001. Active surface Aug. 24th, 2001. 03.29.01 Images Featuring AR 9393! Region 9393 On and Off Band. 3.26.01. From March 22 to March 29th. All Photos imaged 1999 - 2001 (c) Vic & Jen Winter, ICSTARS. Photographed with rear-mounted DayStar Filter with custom "YellowScope" dedicated solar telescope. Configured with RG610 Red glass 4.75" F/15 objective, 2X barlow and 35mm camera mounted prime focus at approximately 3600mm EFL. Using Kodak Technical Pan film, developed with Rodinol, scanned in monochrome, then colorized.